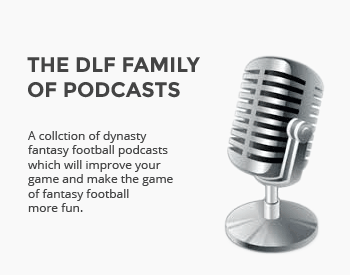 We look at the top dynasty information from around the league this week. The NFL Draft and a large number of dynasty rookie drafts have wrapped up and we are nearing the long stretch of the off-season until training camps begin in late summer. This will be the time when many in your leagues “take a break,” which is just another advantage for you dynasty players. Here’s the top news from the past week in the NFL. The good news for the Broncos disappointing wide receiver Cody Latimer is that veteran Andre Caldwell is no longer around to play ahead of the former Indiana standout. The bad news is Latimer is now in competition with Bennie Fowler for the third receiver’s role. The fact that Latimer is in a competition with a player like Fowler tells us all we need to know about his dynasty value. He’s still rostered in most leagues I play in or monitor, but that may not be true much longer. Former Ohio State receiver Devin Smith suffered through a lost rookie season due to injuries and it doesn’t look like his situation is getting any better. A Jets beat writer recently predicted Smith would be doubtful to play in Week One of the regular season. Smith suffered a torn ACL late in the season and is still rehabbing the injury. Like Latimer, Smith is still hanging around rosters after being a high rookie pick in last year’s draft, but hasn’t done anything to earn that spot. Although the Seahawks have placed running back Marshawn Lynch on the reserve/retired list, speculation is beginning to arise that Lynch may not be done after all. Lynch has never officially announced his retirement, nor has he filed any retirement paperwork with the league and a pair of his Seattle teammates suggested he might play in 2016 after all. Both Michael Bennett and Richard Sherman commented and don’t seem to think we’ve seen the last of Lynch in the league. Considering the state of the running back position across the NFL, Lynch is still worthy of a roster spot while this situation sorts itself out. We learned this week that Lions running back Ameer Abdullah, the favorite to be Detroit’s starter in 2016, underwent shoulder surgery in January. While there is no set timetable for Abdullah’s return, he is expected to be ready to go by the regular season, though he could miss some training camp action. After struggling during his rookie season, this injury is a setback for Abdullah’s dynasty value. The two-year career of Jets tight end Jace Amaro has not gone as most expected. After a quiet rookie season, which is to be expected from a first-year tight end, Amaro missed his second year with a torn labrum. Jets head coach Todd Bowles now admits Amaro is not even guaranteed of making the final roster. Considering there is little competition on the roster, that seems to be a bit far-fetched, but it’s not a good sign for Amaro. He’s barely worthy of a dynasty roster spot at this point. After selecting Ezekiel Elliott with the fourth overall pick in the NFL Draft, there was speculation the Cowboys could be willing to trade either Alfred Morris and Darren McFadden. Dallas executive Stephen Jones says that is not in the works, as the team wants to take advantage of their sudden depth at the position. Clearly, both McFadden and Morris lost the majority of their remaining dynasty value when Elliott joined the team, but both are still worthy of roster spots in deeper dynasty leagues. New tight end Martellus Bennett is reportedly “gaining entry into Tom Brady’s circle of trust.” The Patriots love to use two tight end sets and even though Bennett will not overtake superstar Rob Gronkowski, he could still make an impact in both fantasy leagues, as well as the Patriots lineup. Bennett struggled last season with the Bears, who had given up on their season and Bennett in general. The lack of depth at the tight end position could turn Bennett into a top 12 option in 2016. Bengals tight end Tyler Eifert recently underwent ankle surgery and will miss all off-season activities, including training camp. Eifert is also in danger of missing the first couple of games, according to ESPN’s Adam Schefter. This is a huge blow to the Bengals, who already lost Marvin Jones and Mohamed Sanu during free agency. This could be an opportunity for rookie receiver Tyler Boyd and second year tight end Tyler Kroft, who might be available on your waiver wire. Another star tight end currently on the shelf is new Steelers starter Ladarius Green, formerly of the Chargers. Green signed a four-year deal with Pittsburgh after reportedly undergoing ankle surgery in January. He is expected to miss OTAs, but could be back for training camp. It’s a good sign the team felt good enough to invest big money in Green despite the surgery. He remains a high upside play in dynasty leagues with top ten potential. Veteran running back Arian Foster is reportedly about a month from being healthy enough to pass a physical. This is crucial considering it’s already been reported Foster would wait until he was cleared before signing. A Dolphins beat writer also reported the team continues to monitor Foster and his progress, which would be a blow to the short-term value of both Jay Ajayi and rookie Kenyan Drake.